One of the well-known name in the South Indian Sri Vidya tradition is Sri Bhuvanananda Natha. Is there any brief info about his life events and upasana? He was a well known name in the upasana mandalis of Sri Vidya in the southern india. He was also the guru of Kanchi Paramacharya before his sanyasa. Many people from his parampara has become well known upasakas. 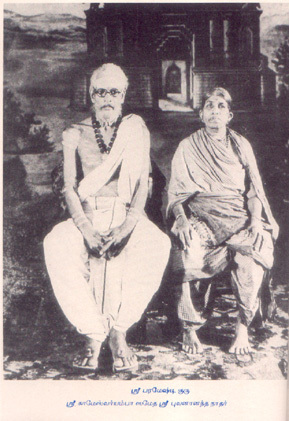 Brahmasri Krishnamoorthy Saastry alias Krishna Sastrigal was the son of Sri Bhaskara Saastry & Smt. Lakshmi Ammal of Tipparaajapuram Near Valangaimaan, Kumbhakonam. He is both a reputed Samskrit &Vedic Scholar. He & his wife Smt. Meenaakshi Ammal of Soolamangalam, Thiruvaaroor got Srividya Poornabhisheka Deeksha from Sri Divyaanandanaatha of Valangaiman and became very famous as Sri Bhuvanaanandanatha the Deeksha naama conferred on him. He stayed for about 7 years at Shankara Mutt, Kumbhakonam and was the “Manthra Guru” to Jagadguru Sri Sri Sankaraachaarya (Paramacharya) of Kanchi Kaamakoti Peetam when the Achaarya was young. He was honoured with the title of “Mantra Moorty”. He did “Tapasya” for 8 years at Oottuppaarai, Kerala & Gwalior and he performed miracles spontaneously. He spent his later portion of his life in doing Sisroosha (service) & seva to his Guru Divyaanandanaatha. At his guru’s demise he performed the last rites in a fitting manner worthy of a great Srividya Upaasaka & Guru as laid down in the scriptures. He showed his devotion & high regard for his Guru by constructing an imposing *Adhishtaana Aalayam (Temple) at his Samaadhi in Valangaiman and installed Siva Linga there. He lived a life of an ascetic and was personally looking after the Temple doing poojaas to the Adhishtaanam. He attained Sripura Sayujya in the year “Sarvadhaari”, Uttharaayanam, Makara (Thai) Maasam, Sukla Paksha Navami (passed away on 26-1-1949). His Adhishtaanam also was built near his Guru in the same Temple. Sri Bhuvanananda Natha was my Great Grandfather. I am his eldest son's granddaughter. He lived in Tippirajapuram and had a family of four children, all of whom are no more. He took Abath Sanyas, close to the time of his demise, and his Adhistanam was placed next to his Guru, Sri Divyaananda Natha, in Valangaiman. There is not much information available from those times and the family members are now spread far and wide. We know that Krishna Sastri's father was Sri Bhaskara Sastri and his mother was Sri Meenakshi Ammal, but we are unable to trace too much of our ancestors beyond this. We would appreciate any further input on his life and times. Not the answer you're looking for? Browse other questions tagged worship guru saint sri-vidya upasana .